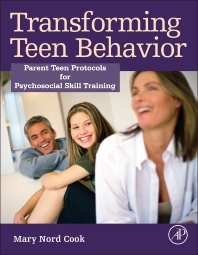 Transforming Teen Behavior: Parent-Teen Protocols for Psychosocial Skills Training is a clinician's guide for treating teens exhibiting emotional and behavioral disturbances. Unlike other protocols, the program involves both parents and teens together, is intended for use by varied provider types of differing training and experience, and is modular in nature to allow flexibility of service. This protocol is well-established, standardized, evidence-based, and interdisciplinary. There are 6 modules outlining parent training techniques and 6 parallel and complementary modules outlining psychosocial skills training techniques for teens. The program is unique in its level of parent involvement and the degree to which it is explicit, structured, and standardized. Developed at Children’s Hospital Colorado (CHCO), and in use for 8+years, the book summarizes outcome data indicating significant, positive treatment effects. What About My Teen Examples? Dr. Cook received her bachelor’s degree (psychology) with honors, from the University of Michigan and her doctoral degree (medicine) from Wayne State University. She completed her general psychiatry residency at the Naval Medical Center, San Diego and her child fellowship training at the University of California, San Diego. This is a great resource for clinicians and a must have for anyone working with teens! As a busy Marriage and Family Therapist, I have enjoyed the opportunity to utilize this great resource. The module's are well thought out and easy to follow. I really appreciate the combination of information for clinicians with practical applications that we can provide to our clients. Highly recommend.